TransLight from Pixel Film Studios offers fully customizable physics based lens flares and light particle transitions all within Final Cut Pro X. With TransLight users have full control over gravity, wind, random motion, and more. Users have full control over start and end position leaving infinite possibilities with a click of a mouse. With TransLight users can transition from one media to the next all with fully customizable lens flares and light particles all with a click of a mouse. TransLight offers fully customizable particles that interact with gravity, attraction, vortex, obit, random motion, wind, and more all within Final Cut Pro X. With TransLight users are given seven different styles all fully customizable with infinite possibilities. Within each preset users have the ability to adjust the angle of view, depth of field blur, focus offset, flare color, flare size, flare fall off, flare streak, particle radius, twist, speed, angle randomness, spin randomness, particle offset, particle glow, particle amount, and much more. Each preset was designed separately to imitate physics, all fully customizable all with in Final Cut Pro X. With TransLight on-screen controls users can adjust the start and end point of each transition effect preset to get a new look each and every time. Users simply click and drag each hockey puck to their desired location and have the choice of setting the animation speed to either constant, ease in, ease out, ease both, accelerate, decelerate, and natural all with a click of a mouse all within Final Cut Pro X.
TransLight was professionally designed to work seamlessly inside of Final Cut Pro X. 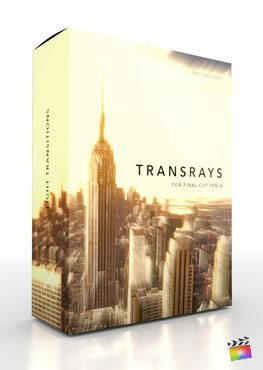 As a FCPX transition each TransLight preset can be dragged and dropped onto the users footage. With the published parameters found in the FCPX inspector, users have the ability to make adjustments and generate their own light particle transition effect with just a few clicks of a mouse. Where do I find TransLight? Once the installation is complete, you can find TransLight in the FCPX Transition library.